Image: Baluchis/Getty Images, molotovcoketail/Getty Images. Design: Kenzie Mastroe/SheKnows. Travel, like any other things in life, requires a bit of practice: The more you do it, the better you get at making the most out of your time and money. People who jet-set for a living have the science of travel down pat. 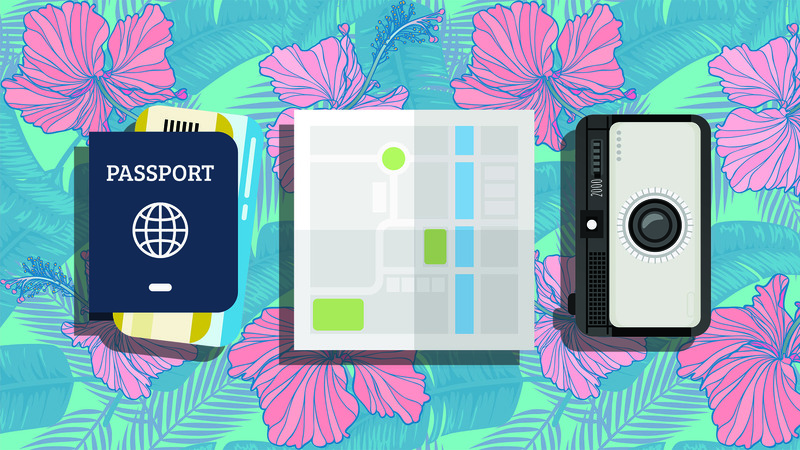 To make your next trip as smooth as can be, we've talked to five masterminds who travel around frequently — from Instagram influencers to experts in the tourism business — for their top hacks on planning the best trip ever. Take these tips to heart, and you'll be a travel pro in no time. When it comes to searching for the best flight, most people just go for larger airports out of convenience. While these major transport hubs offer a wide variety of carriers and flight options, you could rack up serious savings by going with smaller airports further out of town. "Choosing a smaller airport can land you amazing deals: For instance, when I travel in and out of NYC, I’ve found cheaper flights from smaller airports like Stewart International and Long Island MacArthur instead of JFK, Newark or LaGuardia," Debbie Arcangeles, host of The Offbeat Life travel podcast, tells SheKnows. "Plus, they tend to be less crowded, which means less stress!" If you travel internationally at least once a year, you should consider getting Global Entry. It makes the customs process when getting back to the U.S. so much easier and faster. "Last time we flew with a friend who didn't have it, we had to wait over and hour and half for them to get through the regular customs line while we were out in less than 10 minutes," Local Adventurer cofounder Esther Julee tells SheKnows. "On top of that, you also get TSA Precheck with Global Entry." If you live in a city that offers CLEAR, Julee recommends enrolling in the process. It's a program that speeds up your airport security check. Using biometrics to verify identities, members can be moved to the front of the line, where a TSA agent will then ask for their IDs. It's worth signing up just for the VIP experience! Filling in customs forms can be a pain, and if you don't want to shell out $100 for Global Entry, there's a perfect app for you. "Mobile Passport is an app that allows U.S. citizens to save time by cutting the usual immigration lines and take the mobile passport control line instead," says O'Brien. "This can potentially shave off hours at the airport." The service is currently available at 25 airports and one cruise port. Airbnbs are generally cheaper than hotel rooms — especially if you're traveling to a major city. But did you know there are even more affordable alternatives to the popular booking platform? "Try googling local realtors who offer vacation or short-term rentals in the area," Andrea Valeria, vlogger and founder of it's a Travel O.D., a site for digital nomads, tells SheKnows. Here's a great tip: For every great listing you find on Airbnb, check if they are also listed elsewhere. Chances are, you can get a better rate booking through the realtor's own website. "If you’re getting bored of hotels or just want to find an affordable alternative, go into your trip with an open mind and book your accommodations somewhere memorable — such as eco-lodges, tree houses or hostels," travel expert Calvin Iverson of TravelPirates tells SheKnows. Valeria seconds the suggestion. "Eco-lodges tend to be environmentally responsible, ethical to their employees and are located in remote and interesting areas," she says. "Combined with the very competitive rates, it's a win-win!" The only caveat? Some of them may only have electricity at night. One of the best parts about traveling is really getting to know a city or destination. Yes, you should hit up touristy spots — they are popular for a reason — but try to save time for hidden gems too. "We love talking to the valet drivers, doormen or servers — instead of asking the concierge for advice," says Julee. "When you try to get help from a concierge, they may have relationships with neighboring businesses, so you end up getting those recommendations over where the locals actually hang out." If you are a traveler who is open to any destination, Arcangeles recommends using the Everywhere option on airfare search engines such as Skyscanner to search for flights sorted from cheapest to most expensive. That way, you'll get an idea of which destinations are currently the cheapest to travel to — with some unexpected travel inspiration along the way.